André George Louis Onslow, to give him his full name was the son of a French woman and a father from the British aristocracy. Several of the family were in British political life; three were Speakers of the House of Commons. He was born in Clermont-Ferrand where his father had settled after a family scandal forced him to leave his home country. Between 1798 and 1805, Onslow studied piano with, amongst others, Jan Ladislav Dussek - who may have studied with C.P.E.Bach - and Johann Cramer - who had been a pupil of Clementi. That’s a pretty good pedigree for a fledgling composer. As with so many composers before, and after, him Onslow never intended to be a composer. Study of the piano was just one of the many things considered part of your education. Again the usual parental response was that music wasn’t considered a profession, it was a drawing-room gift. Although acknowledged during his lifetime, Onslow’s music has almost fallen into oblivion, with occasional outings in concert and radio broadcasts. His output is large. There are 36 string quartets, 34 string quintets (five with two violas, twenty five with two cellos and four with double bass), ten piano trios, six violin and three cello sonatas, some piano works, a handful of works for ensembles containing wind instruments, four symphonies and four operas. Quite an achievement. The decision to become a composer came whilst listening to the overture to an opera by Méhul. His op. 1 was a set of three string quintets and they were successful so, with the support of his friends and publisher, he continued. Mendelssohn and Robert Schumann, one of the foremost critics of the first half of the 19th century, thought Onslow’s chamber music on a par with that of Mozart, Haydn and Beethoven. It is said that one of the reasons for his fall into obscurity is because performers found his quartets and quintets too difficult to perform. In general he led a quiet and uneventful life and was once the victim of a serious accident. Whilst hunting in 1829 he was shot and badly injured and, although he fully recovered he lost the hearing in his left ear. This incident inspired the last three movements of his 15th String Quintet, which he named "de la balle"- the bullet. Despite his fame, he was known as the French Beethoven, Onslow lived and died in his home town, founding a Philharmonic Society in 1839. He was a respected castle owner, had properties in the countryside, and was a true gentleman farmer, said to be as talented at running his farm as in negotiating contracts with his publishers. Certainly not the usual life of a composer. The Piano Trio in E flat, op.14/2, the fifth he wrote, opens with a broad Allegro which is very Beethovenian in mood and scope. The ensuing Menuetto contains a rather quirky tune and is so short that it is over before it has started. The slow movement is a set of variations on a tune from the Auvergne and the finale is a typically light-hearted affair with a forward momentum which never falters. 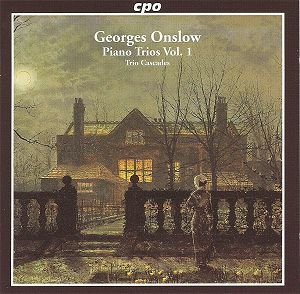 The Piano Trio, op.27 was Onslow’s 9th, and penultimate, work in a genre to which he was not to return for almost thirty years. It follows a similar path to the E flat Trio but, despite being written only six years later, it’s much more mature and assured. There’s more light and shade – in the first movement, for instance, the piano part is often much sparer in texture. The slow movement has a serene outer section surrounding an agitated middle. The scherzo – yes, a real scherzo, not a fast minuet – is jaunty and the finale relaxed but affirmative. The music is still under the influence of Beethoven but the writing is certainly more assured than the earlier work. These are fine performances with a good feel for the music. They bode well for further issues in the series. The notes in the booklet aren’t extensive but they do pack in quite a bit of information. These works are like a breath of fresh air for music of this period.